Chris Froome (Sky) won stage 5 of the Critérium du Dauphiné on Thursday and now leads the race with three days remaining. The 139-kilometer route from Grésy-sur-Aix to Valmorel ended in a challenging, hors categorie climb to the ski resort that spanned 12.7km at an average gradient of 7 percent. Froome attacked in the final kilometer to catch Alberto Contador (Saxo-Tinkoff), and the pair caught stage leader Matthew Busche (RadioShack-Leopard). 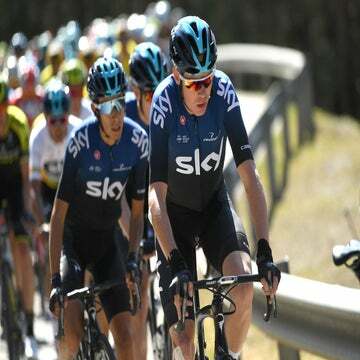 Once the trio was together with about 200 meters left, Froome attacked out of the saddle and pushed hard to the finish line. Contador, who struggled in Wednesday’s time trial, did not have the legs to match Froome’s effort and finished four seconds back in second. Busche had the same time and placed third. Froome’s teammate Richie Porte is 52 seconds behind him in the GC standings, while Rohan Dennis (Garmin-Sharp), who started the day in the yellow jersey, is 54 seconds back in third. A 15-man break that formed early in the stage was eventually reduced to three with 14km remaining and the base of the final climb just over a kilometer away. They were dropped, one by one, over the next 4km. At that point, Tim Wellens (Lotto-Belisol), who had broken away from the peloton, assumed control at the front of the race and began his solo ascent of the mountain. He rode hard as the gap between him and the peloton continued to fall. Busche left the main pack, which was reducing in numbers due to the steep grade, and joined Wellens with 5.3km remaining. Shortly after, Busche pressed forward and took the lead. Behind Busche, Porte was pushing the pace hard at the front of the 12-man group of GC contenders, with Froome on his wheel and Dennis, who did not have any teammates with him, sitting in third. With about 2.5km left, Dennis cracked and immediately dropped off the back of the group. He stayed in the big chainring up the rest of the steep climb, pushing the pedals hard as he tried to keep up. Contador attacked with 1.3km left as he went for the stage win. Porte then pulled off the front of the GC group, his pulling duties done for the day, and Froome countered Contador’s move. Once Froome caught him, the pair reached Busche with about 200 meters to go. That was when Froome initiated his well-timed final move, which neither of his competitors could match. The race resumes Friday with stage 6, a 143km route from La Léchère to Grenoble that contains four rated climbs.